My memory of this show is somewhat hazy, although I do remember it being bloody good. Beth was pissed out of her mind and kept apologising, which was quite funny. She forgot some lyrics but all in all it was a great night. I remember going out to Super Deluxe in the Valley afterwards and getting hellishly pissed as I had come to the realisation that I really didn’t like my girlfriend at the time. 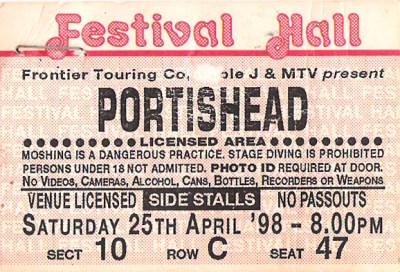 Did you see Portishead @ Festival Hall, Brisbane (Sat 25 Apr 1998)? So far, 1 person has commented, why don't you too?